I have long been fascinated by the role that environmental gradients play in shaping the world around us. Gradients in variables like temperature and water availability determine the distributions of species, and drive the patterns we see in growth form, leaf size and shape, and reproductive strategy. Understanding how the environment shapes these aspects of diversity is fundamental for understanding how natural systems will respond in the face of future environmental changes. For my PhD, I investigated the role that the environment plays in shaping trait variation in Pelargonium. This genus consists of roughly 270 species, most of which are only found in southwestern South Africa. Pelargoniums have incredible leaf diversity. Species in the genus also show incredible variation in the sizes of their geographic ranges, and, consequently the amount of environmental variation they can tolerate. 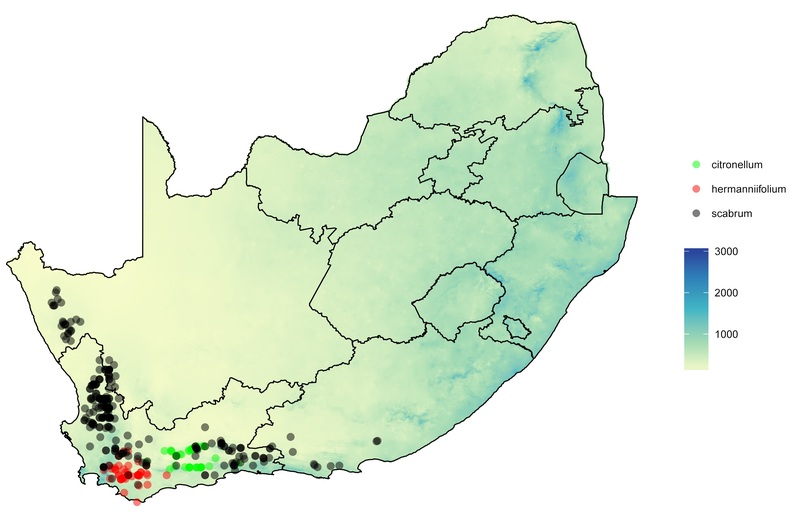 For my PhD, I investigated whether subclades within Pelargonium, that have diversified across South Africa, show similar trait-environment associations. What I found was that, in most cases, clades showed significant differences in their associations between traits and environment, suggesting that they will respond differently to future climate change. As I mentioned, another key feature of Pelargonium is large variation in the sizes and shapes of species ranges. Another part of my PhD was investigating the relationship between niche breadth and range size across Pelargonium. Specifically, I investigated whether the strength of the niche breadth-range size relationship was stronger than expected due to random, spatially autocorrelated environment. I found that, while niche breadth and range size are positively correlated in Pelargonium, the relationship is no stronger than expected due to spatial autocorrelation. This result suggests that estimates of the strength of the causal relationship between niche breadth and range size are biased, and that we may be over-predicting the impacts of climate change on narrowly distributed species.